Project managers probably won't have to be introduced to the difficulties of managing multiple parallel software development projects. From defining user stories and translating them to requirements through all the processes that pave the way to testing the piece of software, managing a single project can be challenging enough in itself. The more projects you're managing, the more difficult it becomes to monitor progress with each of your projects. The task involves keeping track of several complex processes, ensuring collaboration within and across teams, and reporting on the progress of projects to senior management. Without a suitable tool to help keep your finger on the pulse of several processes, monitoring projects can get incredibly time-consuming: gathering and analyzing all relevant data manually or using inefficient tools can feel overwhelming. What's more, a clear overview of processes isn't only vital for project managers: it would also be beneficial for all the team members working on your projects, saving them time and effort in keeping track of processes. To provide users with a dashboard-like overview that enables them to see the progress and quickly access the details of all the projects they're working on is often a basic problem. The brand new Project Browser launched in our latest release, codeBeamer 7.4. offers an easy-to-use and easy-to-filter GUI that lets users categorize and filter. The main screen with convenient tile icons offers a custom coloring feature that lets you identify projects at a glance, by allowing you to select different colors for each project. Click on the arrow on your project's tile icon to access a popup summary of that project: a graph about working item trends gives you a quick rundown on how that specific project is progressing. Below that, you'll find burn down charts for all the releases related to the project, and an activity stream for a more in-depth view of what's happening in that specific project. This feature is a massive time-saver for busy team members and project managers: not only does it give them a high-level overview of the project, but finer details are also available simply by scrolling down. The brand new Project Browser also allows you to create custom working sets for the projects you work on the most, in order to enable you to access these projects with a single click. To facilitate searching among several projects, the Compact List view displays all your projects in alphabetical order – a simple search for the name of the project you're looking for will take you where you need to be in seconds. 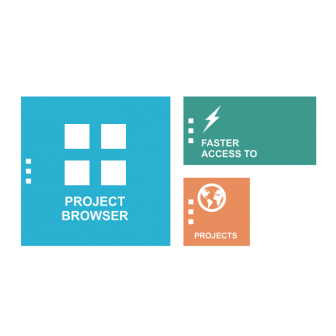 Not only does the Project Browser allow quick access to all of your projects, it also automatically keeps track of their progress, and lets you know where taking action is required. Using the Status filtering feature, your projects will be grouped into categories based on how they are progressing. Green tiles marked 'OK' mean you can lean back, while yellow tiles ('Warning') show you what projects you should consider checking up on. Look for red tiles marked 'Alert' to see where taking immediate action is necessary. This feature is essential in making sure that all deadlines are met, the rate of delivery meets expectations, and by doing so, it also helps to keep the costs of work to a minimum. Managing projects can be a difficult task to tackle, especially as it's one that all members of a team have to become adept at. Using the right tools greatly increases efficiency by reducing the time and effort required to track and access tasks and issues of a project. codeBeamer's Project Browser offers various visualization and advanced filtering features to assist your team in efficiently managing multiple projects, saving you time and making the process more convenient for all users. 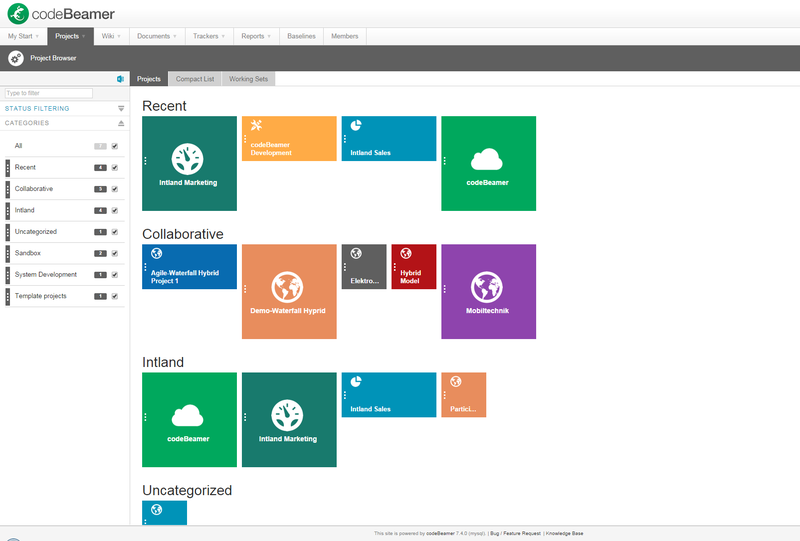 Take a look at our How-to videos to learn more about the Project Management features offered by codeBeamer ALM.